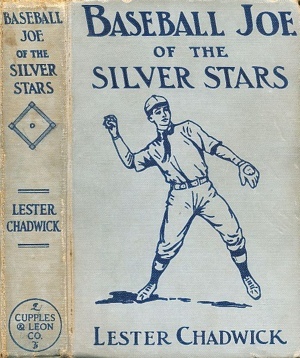 “Baseball Joe” was the star of a series of novels written by “Lester Chadwick.” “Lester Chadwick” wasn’t his real name, but when he wasn’t writing “Baseball Joe” books he was writing “Bobbsey Twins” books, so a little differentiation was needed. Then again, the “Baseball Joe” writer and the “Bobbsey Twins” writer might not have been one and the same, and for that matter the purported “Baseball Joe” writer might not have written “Baseball Joe” at all, so I’m not sure where that leaves us, except with a dawning appreciation of the fluid nature of authorship, and perhaps personhood, in early twentieth century popular culture. For a moment Tom stood there a bit embarrassed, for he saw that something unusual had happened. “I hope you do!” burst out Clara. “Play a good game and—and—don’t worry,” whispered Mrs. Matson to her son as he kissed her good-bye. The team and substitutes were to go to Rocky Ford in two big stages, in time to get in some practice on the grounds that were none too familiar to them. A crowd of Silver Star “rooters” were to follow on the trolley. The captain and managers of the rival teams watched their opponents practice with sharp eyes. “They’re snappier than when they beat us before,” was Darrell’s conclusion. The Resolutes were to bat last, and Seth Potter went up to bat first for the Stars. “Swat it,” pleaded the crowd, and Seth smiled. But he fanned the air successively as well as successfully and soon went back to the bench. Then came Fred Newton’s turn and he knocked a little pop fly that was easily caught before he reached first. Captain Rankin himself was up next and managed to get to first on a swift grounder that got past the shortstop. But he died on second, for the next man up fanned. No runs for the Stars. The Resolutes were jubilant, thinking this augured well for them, but they looked a little blank when Joe retired their first two men hitless. For Joe had started off in good form. With the first ball he delivered he knew that he was master of the horsehide—at least for a time. “But oh! I hope I don’t slump!” and he almost found himself praying that such a thing would not happen. He was in an agony of fear when he heard the crack of the bat on the ball when the third man came up. The spheroid went shooting off in centre field, but by a magnificent stop Percy Parnell gathered it in and the side was retired runless. Things were not so bad for the Stars. For the next two innings neither side got a run, though there were some scattered hits. Again was there talk of a pitchers’ battle, though in the strict sense of the word this was not so, as both Joe and Hen Littell were hit occasionally, and for what would have been runs only for the efficient fielding on both sides. “See if we can’t do something this inning!” pleaded Rankin when his side came up in their half of the fourth. The lads all tried hard and Joe knocked a pretty one that was muffed by the second baseman. However, he quickly picked it up and hurled it to first. Joe got there about the same time as the ball did, and to many he seemed safe, but he was called out. “Aw, that’s rotten!” cried Tom Davis. “Let it go!” said Darrell sharply, and Tom subsided. The Stars got another goose egg—four straight—and in their half of the fourth the Resolutes got their first run. The crowd went wild and Joe found himself clenching his hands, for the run came in because he had given a man his base on balls. The runner had successively stolen second and third, and went home on a nice fly. “I hope I’m not going to slump!” thought Joe and there was a lump in his throat. For an instant he found himself thinking of his father’s troubles, and then he firmly dismissed them from his mind. “I’ve got to pitch!” he told himself fiercely. “We’ve got him going!” chanted the Resolute “rooters.” Joe shut his teeth grimly and struck out the next man. Then he nipped the runner stealing second and threw him out with lightning speed. That somewhat silenced the jubilant cries and when Joe managed to retire one of the Resolute’s heaviest hitters without even a bunt a big crowd rose up and cheered him. And double it they did, the Star boys playing like mad and getting enough hits off Littell to make two runs. “That’s the way to wallop ’em!” sang some one in the visiting crowd and the song composed for the occasion was rendered with vim. Desperately as the Resolutes tried in their half of the fifth to catch up to their rivals, they could not do it. Joe was at his best and in that half inning did not allow a hit. He had almost perfect control, and his speed was good. Only once or twice did he pitch at all wild and then it did no harm as there was no one on base. The sixth inning saw a run chalked up for each team, making the score three to two in favor of the Stars. “I guess so—yes, I can!” he said with conviction. Then came the lucky seventh, in which the Stars pounded out three runs, setting the big crowd wild with joy, and casting corresponding gloom over the cohorts of the Resolutes. The Stars now had six runs and their rivals were desperate. They even adopted unfair tactics, and several decisions of the umpire were manifestly in their favor. The crowd hooted and yelled, but the young fellow who was calling strikes and balls held to his opinion, and the Resolutes closed their half of the seventh with two runs. Neither side scored in the eighth and then came the final trial of the Stars unless there should be a tie, which would necessitate ten innings. Joe was to the bat in this inning, and oh! how hard he tried for a run! He knocked a two bagger and stole third. There was one out when Bart Ferguson came up, and Bart was a heavy hitter. But somehow he did not make good this time. He managed to connect with the ball, however, and as soon as Joe heard the crack he started for home. But there was brilliant playing on the part of the Resolutes. With a quick throw to home the shortstop nipped Joe at the plate, and then the catcher, hurling the ball to first, got the horsehide into the baseman’s hands before Bart arrived. It was a pretty double play and retired the Stars with a goose egg. Still they had a lead of two runs and they might be able to hold their rivals down. It was a critical point in the game. As Joe took his place and faced the batter he felt his heart wildly throbbing. He knew he must hold himself well in hand or he would go to pieces. The crowd of Resolute sympathizers was hooting and yelling at him. Darrell saw how things might go and ran out to the pitcher. “And we will!” exclaimed Joe. The delivery of a few balls, while the batter stepped away from the plate, showed Joe that he still had his speed and control. He was going to be wary what kind of curves he delivered. He struck out the first man up with an ease that at first caused him wild elation, and then he calmed himself. He was almost in despair when he was hit for a two bagger by the next player, and he was in a nervous perspiration about the man stealing to third. Then Darrell signalled him to play for the batter, and Joe did, getting him out with an easy fly. Then there was a mix-up when the next man hit, and by an error of the left fielder the man on second, who had stolen to third, went home with a run, while the man who had brought him in got to the last bag. There were now two out, one run was in, a man was on third and a heavy batter was up—one of the best of the Resolutes. “Swat it, Armstrong! Swat it!” cried the crowd, and the big left fielder smiled confidently. “Ball one!” cried the umpire, after Joe’s first delivery. There was a gasp of protest from Bart behind the plate, for the sphere had come over cleanly. Darrell signalled to the catcher to make no protest. Joe felt a wave of anger, but he endeavored to keep cool. But when the second ball was called on him he wanted to run up and thrash the umpire. The latter was grinning derisively. “Here’s a strike!” cried Joe, in desperation and he was gratified when Armstrong struck at it and missed. “Why didn’t you call that a ball?” asked Bart of the umpire. The latter did not answer. Another ball was called and then a strike. Now came the supreme moment. Two men out, a man on third waiting to rush in with the tieing run, a heavy hitter at bat and three balls and two strikes called on him. No wonder Joe’s hand trembled a little. Joe thought rapidly. He had studied the batter and he thought that by delivering a swift in-shoot he could fool Armstrong. It was his last chance, for another ball meant that the batter would walk, and there was even a better stick-man to follow. We hoped you liked reading Today in Baseball Joe by Mississippi Matt Smith!